Turkish boutique yacht designer and builder Mazu Yachts prepares for a debut at the BOOT Dusseldorf 2018 (January 20-28), presenting for the first time at the German show their Mazu 38 Open White Pearl, perfect both as an overnight cruiser or superyacht tender, thanks the yard’s ability to customize styling, layout and decor. 38 Open White Pearl like all the models from Mazu Yachts are designed by the CEO of the yard Halit Yukay, with his years of practical experience. “As a designer I feel very lucky because I am a professional sailor and captain. I have tried and sailed a number of boats and have had lots of good and bad experiences at sea. As a result we have engineered a boat that can make you feel safe and strong on board in any weather. This is the main idea behind Mazu Yachts”. The new Mazu 38 Open White Pearl impresses with her dynamic design and unparalleled interior and exterior space ampleness and comfort. This unit has an open plan layout with dining space “al-fresco” in the aft deck, an en-suite bathroom with separate full standing shower. 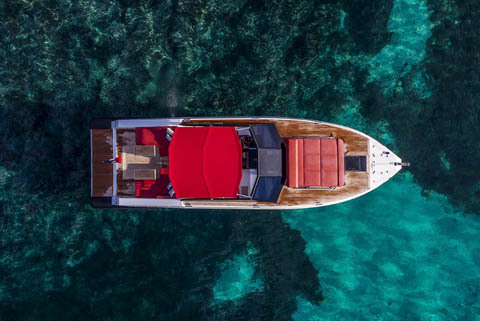 The hull colors are customizable as well as an owner is free to choose from a variety of luxurious fabrics and finishes to use for the interiors. 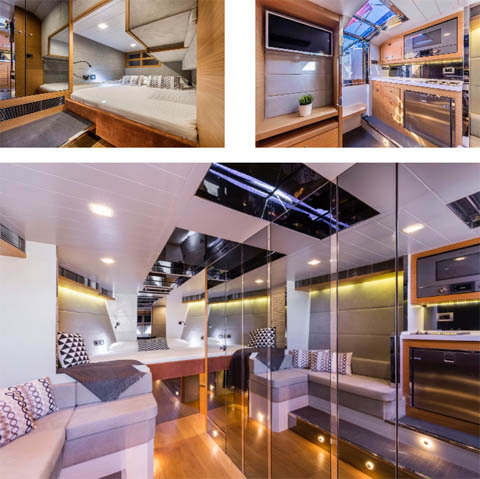 The layout offers a configuration with two king size beds, one forward and the other amidships; the deck layout guarantees sufficient heights to easily move around. The yard’s attention to detailing and styling is enhanced by widespread use of Alcantara. “38 Open White Pearl is the first and only boat we have built in white color to date” - said Halit Yukay - “White stands for elegance and purity. This was the idea behind the design. A white hull makes much easier to keep the boat clean”. To maximize guests comfort, the boat has two galleys with Gaggenau appliances both inside and outside, equipped with cooker, grill, microwave and oven, along with sink, fridge, deep freezer and ample storage for crockery and provisions. A bimini, aft deck shower and swim platform with a retractable swim ladder on the transom, provide added cruising benefits. The hand laid carbon Mazu 38 hull provides extra strength and lightness to the boat. 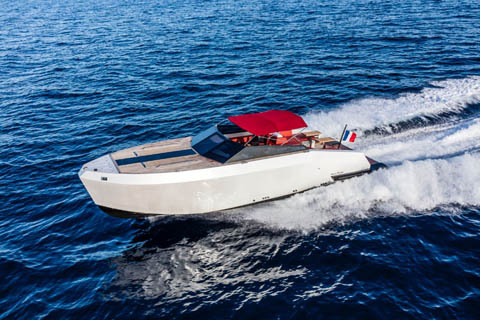 When equipped with twin Volvo IPS 400 engines, top speed is 36 knots, and with the more powerful Volvo IPS 600’s, the Mazu 38 can run right up to 45 knots. The yard also offers the possibility to mount Volvo Penta IPS500 engines. 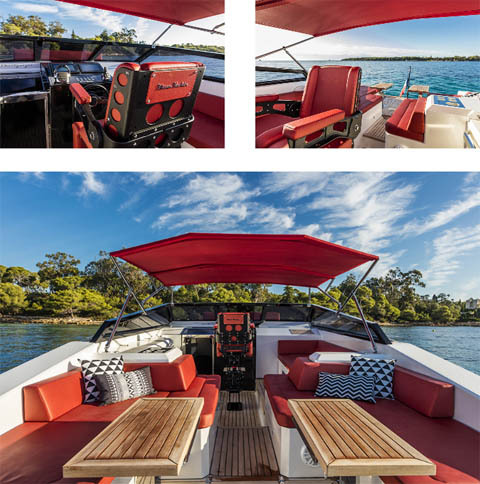 Mazu Yachts has been designing, producing and marketing luxury ‘hard-top and open’ motor yachts since 2011, known for sleek and aggressive looks and made with cold-molded system. The company stands out for ‘hand-crafted art of superyachts’ due to its building technique, which gives the hulls extra strength and lightness. Mazu Yachts Hi-tech shipyard facilities are located in Yalova, one of the best strategic locations for yacht building in Turkey. The Shipyard has 4.000 sqm. of indoor and 1.200 sqm. of outdoor area which gives us all the tools to build perfect yachts. The production site features design offices overlooking the production site where technology, functionality and beauty becomes one. On-site furniture shop provides “dust-free” environment to build beautiful custom furniture for our boats. The new innovative painting booth of 200 sqm. where boats are dry painted in immaculate condition. WHY THE NAME MAZU ? Mazu is the indigenous goddess of the sea who is said to protect fishermen and sailors, and is invoked as the patron deity of all Southern Chinese and East Asian persons. Born as Lin Moniang (Chinese: 林默娘; pinyin: Lín Mòniáng; Peh-ōe-jī: Lîm Bek-niû; Foochow Romanized: Lìng Mĕk-niòng) in Fujian around 960 CE, worship of Mazu began around the Ming Dynasty, when many temples dedicated to her were erected all across Mainland China, later spreading to other countries with Southern Chinese inhabitants.